Key 1989-90 stat: 14 cameos on "L.A. Law"
Welcome to NBA Playoffs Week: The NBA playoffs are in full swing. 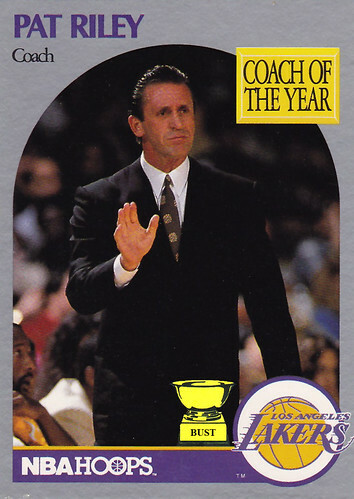 With only four months left before the Finals are decided, we at the Bust have decided to bring you seven more days of terrible basketball cards and even worse jokes. You're welcome, America. 10) "$12,000 Suit of the Year"
9) "Los Angeles Stereotype of the Year"
8) "Cosa Nostra NBA Infiltrator of the Year"
7) "Aqua-Net Customer of the Year"
6) "Laker Girl Pimp of the Year"
5) "Golden, Shining, Heavenly, Magnificent Tan of the Year"
4) "Armani Catwalk Model of the Year"
3) "Alligator Skin Shoes of the Year"
2) "Alligator Skin of the Year"
1) "Cocaine of the Year"